You know, I was embarrassed last week when I lost that screw to Riley's hospital plate -- felt like such a bozo. It's the worst kind of stupid mistake, the kind you have to reveal to half the planet because you can't fix it yourself. I'm happy to report that the Internet has offered me some vindication. By chance the other day, I was googling hospital plates to see if I could find a type that Riley could be turned out in (hope springs eternal). 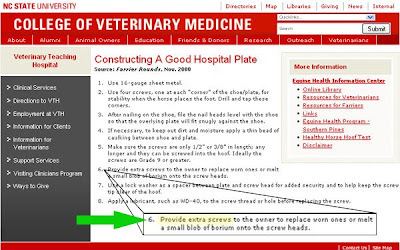 Click on this image (a Web page from the NCSU Vet school) and notice the part that I've highlighted/enlarged. Yippeee! Never mind that it says to provide extra screws in case they get worn (not lost). Yes, it is vindication. Suppose you took the screw out and it stripped? Anything could happen besides losing one. Sounds as if Riley is doing well off the antibiotics? How much longer will he need to be "laid up" before he can go back to work? Ah, you did not get your "spares"! Ha ha !! A small victory is still a victory! Enjoy the vindication!